The walk is named after James Herriot; the fictional name given to the real-life veterinary surgeon who lived and worked in the Dales for many years. In life James Herriot was really Alf Wight and the Herriot Way is based on a walking holiday he took with his son Jimmy, around the Youth Hostels of Aysgarth, Grinton and Keld. In the early 1990’s, Norman Scholes, a devotee of the Yorkshire Dales, extended the route to include the newly opened hostel in Hawes and adding an extra day to the walk. His guide book is sadly no longer available, but it established the Herriot Way as a much-loved and well-known long distance path. 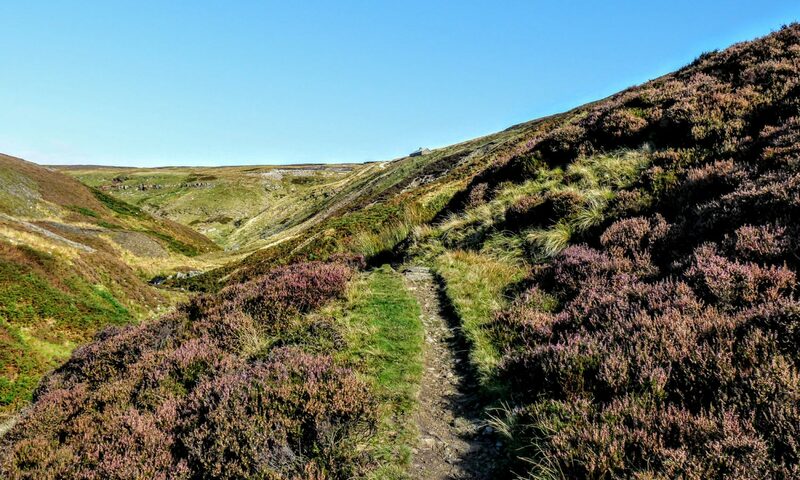 This new Walking the Herriot Way guide book provides a detailed, step-by-step route description and a series of hand-drawn, annotated maps, as well as a wealth of information to help you plan the walk. The guide book has 126 pages, weighs 120g and is 18cm high and 11cm wide, perfect for fitting into a jacket pocket, or the side pocket of a pair of trousers. The book describes the walk in a clockwise direction, as this is the way most people walk it. If you prefer to walk anti-clockwise then there is a Digital PDF Edition of the guide book, which you can find in the shop. I can sincerely say I have never had a better book to guide me on a long distance path. Attention to detail was impeccable and not a foot on a wrong path was made. Only on a couple of occasions did the Ordnance Survey map come out just to confirm our whereabouts. Just wanted to say a big thanks it's makes a huge difference when you have confidence in your guide book. Especially in bad weather which we had on and off. Lovely path and will recommend it to friends. I've done a bit of walking, but this was my first trip out by myself. And I don't know what I would have done without your book! There were sections where, as you pointed out in the book, the way wasn't clearly marked or the path was difficult to follow. I'm glad that, in those cases, you gave directions using landmarks! The extra tidbits you added (historical notes, tips on where to find local treasures, and even some humorous commentary) were also greatly appreciated! Thank you so much!! I wanted to say how good we found the book - it really is excellent. The accompanying maps are great and ensured we found our way through the grouse butts on Greets Hill! I cannot speak highly enough of your book. The narrative was excellent with many hidden gems of 'inside information'. The attention to detail made it an invaluable guide - thank you! Just a few lines to tell you how much I enjoyed my trip to the Dales. I found your book fantastic, I felt at all times completely safe and confident that I was on the correct path. I hope to go back again another time. I walked the Herriot Way last week and just wanted to say thanks for your excellent guide book, the detailed descriptions meant that I hardly had to refer to the maps or use my OS one. What a superb walk it is and although I know the Dales fairly well this linked everything together to give a tremendous overview of Wensleydale and Swaledale. I walked the route on my own this weekend over two days, starting and finishing in Hawes, with a stopover at Grinton Lodge YHA. Really enjoyed it and used only the maps (guidebook was in my bag but I managed with just the maps). Unfortunately I didn’t get to admire the scenery from Great Shunner Fell as the clag was well and truly down so I’ll have to use that as an excuse to go back another day. I’ve done quite a few long distance routes but so far I’d say this one has the best scenery and I’d definitely recommend it. This walk is an ideal pre-season warm up for a regular long distance walker. My wife and I completed it last week and the scenery is truly stunning and the waterfalls, due to recent rain, were in full spate and spectacular. There are ideal lunch stops on all 4 days and plenty of other pubs/tea rooms along the way. Took an OS map with me but didn’t really need it as guide book is so easy to follow and fits nicely into a jacket pocket. My wife, two friends and I did the walk anti clockwise, Wednesday to Saturday this week past.We only had the clockwise book, being unaware that there was an anti clockwise version. Thus It was an interesting orienteering exercise. The only real difficulty we experienced, while trying to find our way, was where you cross the Gunnerside Beck, crossing the slab foot bridge beside the beautiful old arched ruin. We descended down into that valley via a route indicated by a sign saying “Keld” It wasn’t a good way to descend. Your way would have been to descend slightly further on. I tried to rely on my OS map to get out of the Gunnerside valley and foolishly thought the path initially followed Blind Gill. I quickly learned my mistake, even although there were a lot of boot prints that indicated others had been that way before. We then took the path down Gunnerside Gill past Dolly Lead level to the footpath that strikes off North just before the waterfall at Botcher Gill Gate. We thoroughly enjoyed the trail. Using your descriptions, we marked the route out on the 2.5 inch to the mile OS Explorer map and that was also a help. Me and a friend who are relatively fit but have never done any multiple day walks with gear have just completed this walk in 4 days with ~12kg rucksacks….Amazing walk!. The first day is a nice flat starter along the river to get your body going, followed by the 2nd day up Shunner fell which we found tiring but perfectly fine. The 3rd day started with quite a steep climb which killed our legs early, leading to a longer lunch stop at Gunnerside gill before heading up another steepish climb onwards. The 4th day we found ok, although really just a moor walk which we found a little boring to finish on….. Theres only so much moorland you (we) can enjoy in one trip. All 3 nights were wildcamped in the villages, just setup out of town quite late on, had no bother at all from angry farmers with all locals being very friendly indeed. I walked the route on my own this weekend over two days, starting and finishing in Hawes, with a stopover at Grinton Lodge YHA. Really enjoyed it and used only the maps (guidebook was in my bag but I managed with just the maps). Unfortunately I didn’t get to admire the scenery from Great Shunner Fell as the clag was well and truly down so I’ll have to use that as an excuse to go back another day. I’ve done quite a few long distance routes but so far I’d say this one has the best scenery and I’d definitely recommend it. My wife and I have just completed The Herriot Way using the Kindle book download and taking four days on the walk. We started at Aysgarth. The directions and the attention to detail within was outstanding. Only had to look at OL30 once! The only part we struggled with was actually locating grouse butts 7 and 8 after High Harker Hill. They are very well hidden. Day 3 is also hard work if you take the high route through the lead mines from Keld to Reeth. We both thoroughly enjoyed the experience and are now planning our second LDW. My wife wants to know if you’ll do directions for every other trail?!! Will be doing this Walk with a Work colleague on Sunday the 8th January 2017. We are aiming for under 16 Hours and is a Warm up for the Dales Way 80 Miles we will be attempting in one go to Raise Money for a Work Colleague. My friend and i decided to try the walk as a long distance challenge and managed it in 2 days. Although this defeats the object of seeing the fantastic scenery and taking in the breathtaking views, it is a great challeng Aysgarth to Twaite was a good 22 mile hike and Twaite to Aysgarth was both challenging and exciting. I will definately be back to the area and take my time (a few days at least) to enjoy Swaledale. I purchased the anticlockwise version of the book; it looked great on a tablet. I also got a wellthumbed backup copy from the kindest of hosts at Herriots Hotel in Hawes where I used their drop-off and pickup service to complete the walk. It was the end of July 2014. The weather was great: sunshine, dramatic clouds, a few drops of rain one afternoon. The walk was unsurpassable. I promise you I could not have done it without the book. You read ahead 3 or four next stages, then stuff the book in your pocket and forge ahead with confidence, fully trusting the guide, enjoying the scenery, taking pictures of a bird or rock or sheep or barn or grand vista… Until you need to get your bearings again. A rare experience. We found the route description in particular really accurate, detailed and helpful. It would be really hard to get lost with it! The narrative also had some really interesting information about the area we were walking through. All content copyright © 2009 – 2018 Stuart W. Greig | All rights reserved.